Bob Pappanduros and Steve Johnston Display some stunning samples of their culinary artistry in the kitchen of the Scottsdale Hilton. SCOTTSDALE – What are a psychology major and an avid golfer doing in the kitchen of a major result hotel? Bob Pappanduros and Steve Johnston may seem an unlikely pair to be dishing out exotic food, but they are the executive and banquet chefs for the Scottsdale Hilton, 6333 N. Scottsdale Road. The “hard knocks” came in the kitchen of his father’s Chicago restaurant, where he worked for seven years to pay his way through college. 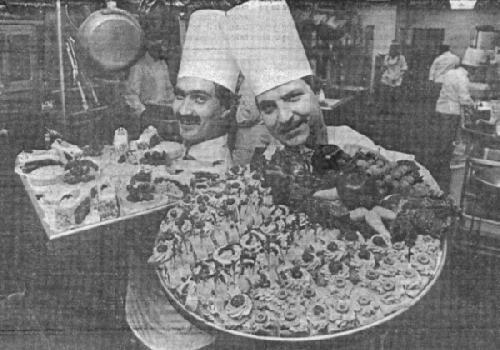 In 1982, when he came to Phoenix, Pappanduros found that social-service jobs were scarce and did not pay as well as cooking. Johnston, a bachelor who turned 28 on Christmas, took a more traditional route, by graduating from the Washburn Culinary School in Chicago. While the Washburn school provided him with a profession, the profession destroyed the 2 handicap he once had on the golf course. “I come from a long line of golfers,” he said, adding that he began playing at 8 years old, was on his high school golf team and now holds a 12 handicap – and a good kitchen job. Both say the average homemaker could entertain more successfully and be a better cook if she would plan more, cook less and watch waste like a hawk. The Hilton kitchen served more than 800 people for Christmas brunch and 250 for New Year’s Eve. It routinely serves 300 to 400 meals a day. While the two pros direct a kitchen staff of 30 or more to prepare a party, they said homemakers can turn out great parties. “Planning is really important,” Johnston said, adding that the simplest items sometimes are the most important. For instance: How many people will be served? And what time of the day will the party be held? “If you plan an early gathering, around 6 or 6:30 p.m., people will expect to be served a meal. The menu should be substantial. “Basically, do the food preparation in the morning or even the day before,” Johnston said, “and clean the house in the afternoon. “Then you can change and put the food out just before the guests arrive, and have the rest of the time to enjoy the party. As a banquet chef, Johnston has party preparation down to a science. As executive chef, Pappanduros watches the budget. Vegetable peelings – Use them in soup stock and strain them out later. You can even use the dark brown outside peelings of onions, which add color and substance to the broth. Bones – Boil them for soup stock. Leftover meats – Use for hash, casseroles or soups. Dried bread crusts – use for bread pudding and stuffing. And don’t forget pastries: Dried-out Danish rolls make great puddings. Mashed potatoes – Save them for potato pancakes, cream soup bases. “Cooked meats can safely be frozen for long periods, but can be safely thawed only once, he explained. Most home cooks have a problem with leftover cooked vegetables. But the solution is simple, Pappanduros said. “Cooked vegetables lose texture and flavor, making it difficult to serve them again. Make them into a puree and use it in a creamed-soup base. Johnston and Pappanduros said that while food fads come and go, there are some standards that never change. Plan a menu with some idea of what can be done with leftovers. In general, both men agreed that American tastes are shifting to fresher, locally grown foods. “People want to identify with their own culture. That is reflected in local-food specialties, which are more and more popular on local-restaurant menus,” Pappanduros said.